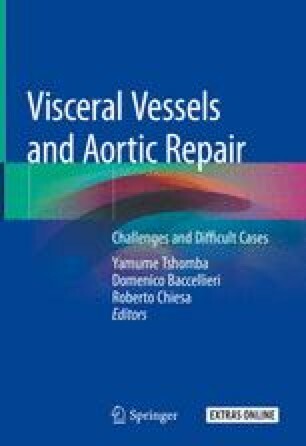 Vascular surgery, in which a supraceliac aortic clamp is required, is at highest risk of visceral ischemia and postoperative complications. The interruption of the blood flow to the organs, secondary to the artic cross-clamp, triggers cellular and molecular alterations with local and systemic effects. In particular, the tissues distal to the clamp become ischemic with a shift from aerobic to anaerobic metabolism. Since the reperfusion, following aortic clamp removal, may further increase the organ damage of the ischemic tissues, an ischemia/reperfusion (I/R) injury is usually observed during aortic surgery. The I/R injury is responsible for an extensive systemic inflammatory response which may trigger postoperative multi-organ failure. Polymorphonuclear neutrophils, oxygen radicals, nitric oxide, complement system, and cytokines are mainly involved in this double pathophysiological phenomenon. In light of this, any technique, strategy, or drug able to mitigate the I/R injury may significantly affect the outcome. Although several perioperative medications have been proposed, the results remain elusive. On the contrary, left heart bypass, CFS drainage, and avoidance of nephrotoxic drugs, together with a maintenance of a mean arterial pressure above 80 mmHg, have shown to be the only measures effective in reducing perioperative morbidity and mortality. The online version of this chapter ( http://doi.org/10.1007/978-3-319-94761-7_14) contains supplementary material, which is available to authorized users.